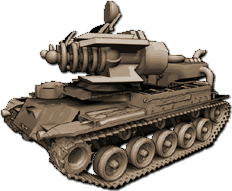 In this article, the Tesla Coil and mobile variants of it will be compared to real Tesla coils. 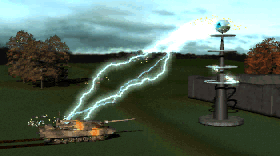 The Tesla Coil is a signature weapon of the Soviet arsenal starting from the first Red Alert and onward. The first thing that should be covered is what a Tesla coil actually is. Put simply, a Tesla coil is a transformer that steps up voltage while decreasing current. The higher the voltage, the farther electricity can travel through the air. So when the voltage is high enough, it can cause electricity to arc over significant distances. Starting with the least important departure from reality C&C Tesla Coils take, their appearance more closely resembles that of a Van de Graaff generator than Tesla coil. That doesn’t necessarily mean a Tesla Coil couldn’t be designed differently for some sort of aesthetic reason or perhaps with extra metal plates for protection against attacks, but the spherical structure on top presents new problems. A Tesla coil needs some sort of point where the electric charge can build before it will begin arcing through the air. If the Tesla coil’s surface is too smooth, the charge will be evenly dispersed and no arc will ever form. A small protrusion in the form of a metal wire or spike on the side of the sphere should be sufficient though, and it might be possible to rig such a thing up to rotate around the sphere toward the Tesla Coil’s intended target. The largest obstacle for the Tesla Coils to overcome would be arcing the electrical bolts from the sphere to their targets, due to the voltage requirements to get that far, and how high the discharging sphere is off the ground. Many variables affect how far electricity can arc through the air, but arcing to a tank 200m / 656ft away will take around 600 million volts. Unfortunately, since the ground will be the ultimate goal for the arcs, the Tesla Coils should not be able to arc farther than the distance to the ground. Additionally, unlike many other real or theoretical weapons, electricity is very difficult to focus without a conductive medium. The bolts generally spread out in a fairly random pattern as they seek something more conductive than the air that will bring them closer to the ground. The only way to circumvent these limitations would be to produce some sort of conductive medium between the coil and the target. A possible solution would be a laser-induced plasma channel. As powerful lasers pass through the air, they heat the atmosphere into plasma, called blooming. This plasma is electrically conductive and could carry the arc over a greater distance if it was discharged within a fraction of a second after the laser was pulsed. However, it is unlikely the resulting electrolaser weapon would generate the multiple-arc visual effect as seen in the games. The energy requirements for Tesla coils would be high as well. Not so much that a base’s power supply couldn’t operate one, but it would not be a very efficient use of the energy when it could be used for a more effective weapon instead. However, the energy requirements will become a more significant factor when it comes to the mobile variants of Tesla coils. A Tesla Trooper shouldn’t be able to get more than a couple shots off before needing to plug himself in to a power source to recharge. Finally, the damage cause by Tesla Coils will also need to be examined. Because Tesla coils necessarily use extremely high voltage, they must contend with what is known as the skin effect, which is the desire for high voltage electricity to stay near the surface of the object it is passing through. How deep the electricity will penetrate into the surface is called the skin depth and is determined by multiple factors. One of these factors, electrical resistance, means that human flesh will cause less of the skin effect to the point of being negligible. More importantly, in metal surfaces, the skin effect will not penetrate very deeply at all. Metal can be easily damaged by electricity, like while arc welding, but it is the current that causes the metal to heat up, and Tesla coils, by design, sacrifice current for voltage. The low current and skin effect, both a result of the high voltage produced by Tesla coils would make metal bodied vehicles effectively immune to the electrical bolts.